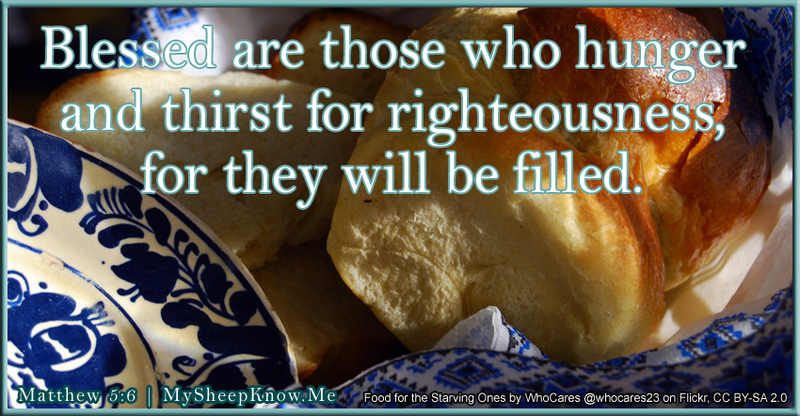 What does it mean to hunger and thirst for righteousness? What is righteousness? In the original Greek, “righteousness” is δικαιοσύνην, or transliterated, “dikaiosuné,” or “dikaiosýnē” (pronounced dik-ah-yos-oo’-nay) meaning “justice,” “justness,” “righteousness,” a “verdict of approval,” or more specifically, “God’s judicial approval.” So we can see, righteousness involves being just and on the side of right in God’s eyes, should we be judged. How do we know that we are right in God’s eyes? We can only look to what is said about righteousness in the Bible. Therefore anyone who sets aside one of the least of these commands and teaches others accordingly will be called least in the kingdom of heaven, but whoever practices and teaches these commands will be called great in the kingdom of heaven. For I tell you that unless your righteousness surpasses that of the Pharisees and the teachers of the law, you will certainly not enter the kingdom of heaven (Matthew 5:18-20). The Pharisees interpreted this to mean a physical binding of the Law, when it meant a binding of heart and mind that leads through to the works of your hands. The other Laws were similarly turned into many other rules that were not intended. Through Jesus’ teachings and actions, he revealed the true meaning and intent of the Law. This is how we can be more righteous than the Pharisees, by not living to the letter of the interpretations of the Law but the spirit of it. However, be careful that you do things for God and not for appreciation from other people. Be careful not to practice your righteousness in front of others to be seen by them. If you do, you will have no reward from your Father in heaven (Matthew 6:1). Righteousness begins with repentance, and it doesn’t matter who you are or what you’ve done before. God doesn’t play favorites. God does not show favoritism but accepts from every nation the one who fears him and does what is right (Acts 10:34). Truly I tell you, the tax collectors and the prostitutes are entering the kingdom of God ahead of you. For John came to you to show you the way of righteousness, and you did not believe him, but the tax collectors and the prostitutes did. And even after you saw this, you did not repent and believe him (Matthew 21:31-32). If you want to be on the right side of God’s judgment, the answer is to live a life of faith. By faith, we gain righteousness because Jesus paid the penalty for our sin. Therefore no one will be declared righteous in God’s sight by the works of the law; rather, through the law we become conscious of our sin. For in the gospel the righteousness of God is revealed — a righteousness that is by faith from first to last, just as it is written: “The righteous will live by faith.” (Romans 1:17,20). This righteousness is given through faith in Jesus Christ to all who believe. There is no difference between Jew and Gentile, for all have sinned and fall short of the glory of God, and all are justified freely by his grace through the redemption that came by Christ Jesus. God presented Christ as a sacrifice of atonement, through the shedding of his blood — to be received by faith (Romans 3:22-25). Here’s the plain truth: people didn’t invent God, we will be judged after this life, and the proof there really is an afterlife is that Jesus was raised from the dead. We should not think that the divine being is… an image made by human design and skill. In the past God overlooked such ignorance, but now he commands all people everywhere to repent. For he has set a day when he will judge the world with justice by the man he has appointed. He has given proof of this to everyone by raising [Jesus] from the dead (Acts 17:29-31). God promises that if you hunger and thirst to act out your faith, repent and be righteous, you will get to know God’s love and his provision for your life. Ask and it will be given to you; seek and you will find; knock and the door will be opened to you. For everyone who asks receives; the one who seeks finds; and to the one who knocks, the door will be opened (Matthew 7:7).